i love eating gnocchi. i love saying gnocchi. but i’ve never wanted to make it out of sheer laziness. i finally tried it and it wasn’t even that hard. in fact, in total prep and clean time, it was faster than making noodles with my kitchenaid. Bake potatoes for 45-50 minutes at 400 degrees. After potatoes have cooled, peel the skin off (or scoop out the potato with a spoon). To make proper gnocchi, you are supposed to run the potato through a ricer, which makes it fluffier and gets rid of the clumps. I just took a fork, thought about things that annoy me, and went to town breaking down the potatoes until there were no more clumps. Add 1/2 cup of flour, egg yolk, and salt. Knead the mixture and add flour as necessary until it turns into a play-dough like consistency. Break the dough into 4 pieces. On a floured surface, roll the dough into long logs about 1/2 inch in diameter. Take a knife and cut the log into 1/2 inch pieces. 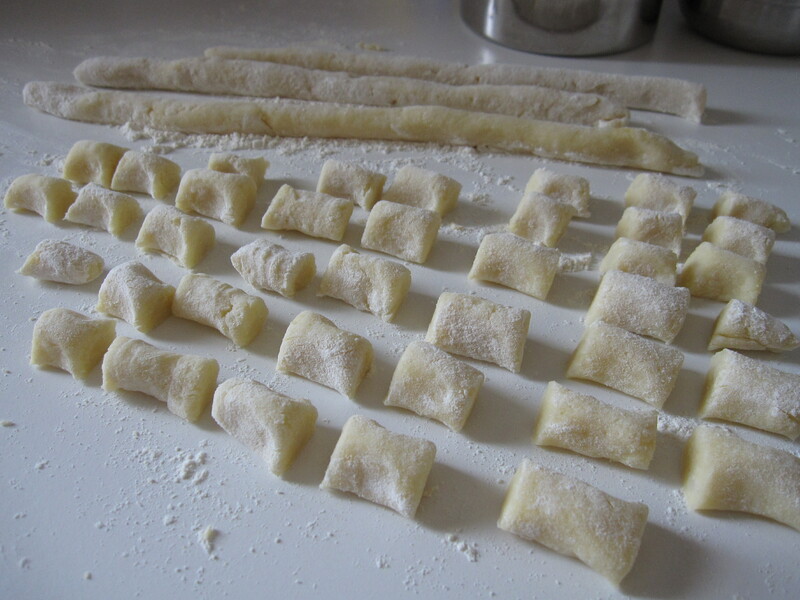 Bring a pot of water to a boil and cook the gnocchi until they float to the top and then cook for another 2-3 minutes. Drain and rinse under a cold water bath. Pour a little bit of EVOO on top of the gnocchi to keep from sticking. 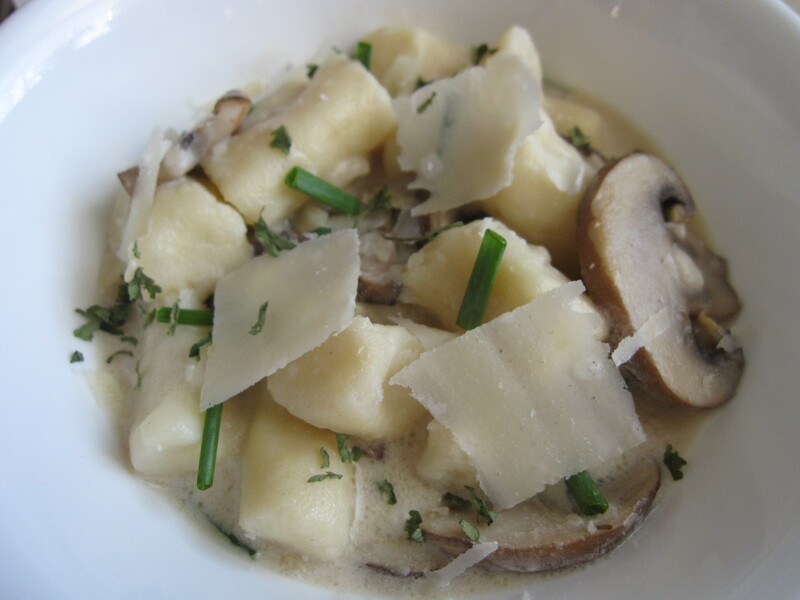 Simultaneously as the gnocchi cooks, you can prepare the mushroom cream sauce. Melt the butter and add EVOO and the sliced mushrooms. When the mushrooms are tender, add the vegetable stock. Once the stock boils, add the heavy cream, stirring until the sauce thickens. If it doesn’t thicken enough, you can make a roux-like mixture with flour and water and add it to the sauce. Once you are satisfied with the consistency of the sauce, add the gnocchi and stir until the sauce is evenly spread out. Plate and garnish with chives, parsley, and fresh parmesan cheese.